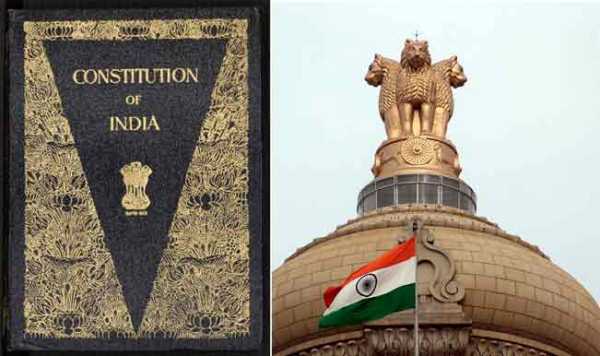 Some Lesser Known but Interesting Facts about the Indian Constitution. How many do you know? 26th January 1950, the day a new democracy was born, the day India saw its constitution come into being, the day every Indian feels proud about, the day India became a republican nation. In 1946, the British began to seriously consider granting India independence and sent a Cabinet Mission to India with a plan to meet representatives of the British government and various Indian states, to discuss the possibility of setting up a Constituent Assembly to draft the framework of the Indian Constitution. Here are some lesser known facts on how the Constitution of India was written. The original Constitution of India was handwritten by Prem Behari Narain Raizada in a flowing italic style with beautiful calligraphy. Each page was beautified and decorated by artists from Shantiniketan. The original copies of the Indian Constitution, written in Hindi and English, are kept in special helium-filled cases in the Library of the Parliament of India. The Constitution of India is the world’s longest and most comprehensive constitution and contains 25 parts, 448 articles, and 12 schedules. The original Constitution had 395 articles and 9 schedules. It took around 2 years, 11 months and 17 days for the assembly to finish writing the entire constitution. The drafting of the Constitution was finally complete on 26th November 1949. But, it was legally enforced only after two months on 26th January 1950. Which came to be known as the Republic Day. The handwritten Constitution was signed on 24th January 1950, by 284 members of the Constituent Assembly, which included 15 women. It came into force two days later on 26th January. Our Constitution makers took inspiration from various other Constitutions while drafting the one for our country, which is why the Indian Constitution is often called a bag of borrowings. France: The Preamble of the Constitution of India includes the ideals of Liberty, Equality, and Fraternity. The inspiration came from the French Revolution when these were first formed. Great Britain: The Indian Parliamentary System is largely influenced by the structure and functioning of the British Parliamentary system. An inspiration for law-making procedures, rule of law and the principles of single citizenship came from the British Constitution. Canada: Concept of strong central authority in a federal structure. USA: The Indian Preamble begins with “We the people” and its inspiration came from the Preamble of the American Constitution. Features of Fundamental Rights, Independence of the Judiciary, the Judicial Review system, removal of Judges of Supreme Court and High Court also came from the US constitution. Republic of Ireland: Directive Principles of State Policy. Germany (Weimer Constitution): The concept of Emergency. USSR: The concept of Five Year Plans.